As I sit here every day, thinking about what I want to write about, I worry that I am changing the who I am in the eyes of my friends. 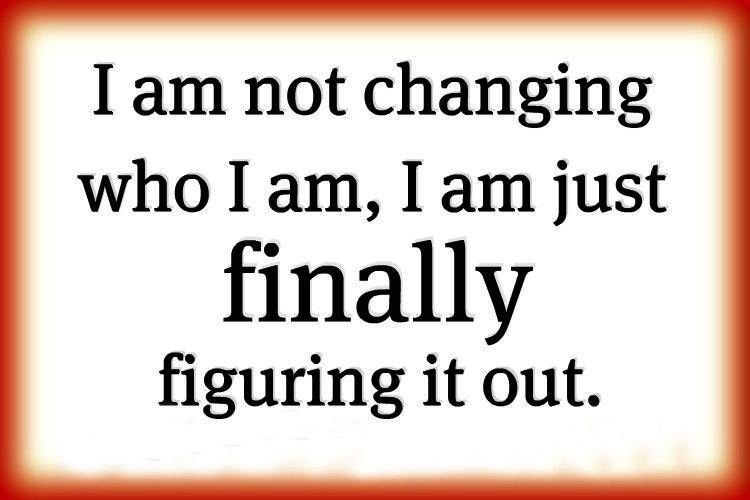 I really do not think that the challenge I have given myself, this journey, this search for a healthier me is doing anything to alter my personality. This is a way for me to not only be healthier in body, but also to rediscover the parts of me that I lost so many years ago to a failed marriage, making me healthier in mind, too. I am looking for those long buried pieces of me to see whether they still fit, and if not, then I hope to find the new pieces, the ones that fit the 42 – 43 year old me, the sometimes wiser one. This online, open to anyone, journal, blog is about every part of my transformation. Some people will hate it, think it is ridiculous, and that is fine with me. Others may pay attention to some of it, finding they can relate to bits and pieces of what I post, and maybe find something useful in my rambling words and thoughts. Then there are those who are tired of sitting at home, hiding behind a mask, afraid to do something, anything, because they have lost a bit of their sparkle, their hope. I am the last one, the person who was losing hope. I hated looking in the mirror, I looked for reasons to not do anything outside of family and work, all because of what I had let myself become. I cannot be this person anymore. Make or become different: “a proposal to change the law”; “beginning to change from green to gold”.